Heather Pointe Condo, Sterling Heights - New Condo Listing: 14864 Heather Pointe Dr, a 1,500 sq. ft., 2 bath, 2 bdrm ranch "Attached Ranch Condo". Now MLS® $135,000 - Condo For Sale. Warm, neutral-colored paint is key when staging your home. It’s harder for buyers to picture themselves in your home when they’re looking at your family photos, collectibles, and knickknacks. Pack up all your personal decorations. However, don’t make spaces like mantles and coffee and end tables barren. Leave three items of varying heights on each surface, suggests Barb Schwarz of www.StagedHomes.com in Concord, Pa. For example, place a lamp, a small plant, and a book on an end table. If you’re a hot water multitasker who washes clothes, dishes, and yourself at the same time, a low-capacity tankless water heater could serve you a “cold water sandwich” or leave you high and dry. But tankless water heaters, which heat water only on demand, are more energy-efficient than traditional water heaters, which warm water whether you need it or not. What’s the best way for you to get into hot water? Read on. Traditional hot water heaters typically live in your basement and provide gallons of hot water at one time: an 80-gallon tank heats enough water to shower, run a dishwasher, and do a load of laundry simultaneously. But standby energy loss is significant with hot water heaters, and once you’ve exhausted the hot water supply, you’ll wait 20 to 60 minutes for the heater to cook up more. Although a tankless water heater can pump hot water all day, it can’t produce a large amount all at once. And it can snap you out of a hot shower bliss with the “cold water sandwich effect,” a sudden splash of cold water that results from turning the hot water faucet on and off repeatedly. A traditional tank heater puts out 7.5 to 9.5 gallons of water per minute (GPM), enough to shower, run the dishwasher, and do a load of laundry all at the same time. The typical tankless water heater, however, puts out only 2.5 to 5 GPM, enough to handle only two uses at a time. Be warned: Not all flow rates are calculated the same. Energy Star measures GPM based on a 77-degree increase in water temperature for the incoming supply, while some companies list their GPM flows at 35- and 45-degree rises. The more heat the water requires to reach the desired temperature, the slower the flow rate. 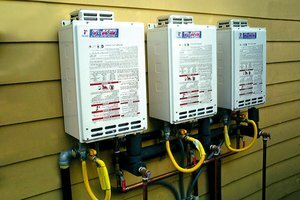 A gas-fired tankless water heater system costs $1,500 to buy and install, nearly double the price of a conventional gas water heater, and $575 more than a high-efficiency tank model. In addition, while a conventional water heater typically uses a half-inch gas line, a tankless water heater requires three-quarter-inch pipe. That plumbing change costs from $25 to $40 a foot, potentially adding many hundreds to initial costs. On the bright side, your new energy-efficient unit may qualify for a federal tax credit of up to $300 on purchase and installation through 2011. An electric tankless water heater costs as little as $400 installed. But it doesn’t qualify for a tax credit because it is less efficient than gas and is better suited for point-of-use applications, such as instant kitchen hot water, rather than a whole-house system. One solution to the limited output problem is to install multiple on-demand units. Because it’s small—about the size of a carry-on suitcase—you can place a tankless water heater along any stretch of pipe—in the attic, basement, closet, or crawlspace. You can install two or three units to serve different parts of the house, or even dedicate a unit for a particular use, say a washing machine. Multiple on-demand units increase overall energy efficiency. By bringing hot water close to where it’s needed, you reduce energy loss and increase efficiency by 50% over a conventional hot water tank system, about $165 in annual savings for an average household. According to the U.S. Dept. of Energy, a tankless water heater is more efficient and uses less energy than a conventional water heater, providing a $25 to $107 in annual savings. If your hot water use is low (less than 41 gallons per day), a tankless water heater will be 24% to 34% more efficient. If your hot water usage is high (about 86 gallons per day), a tankless water heater is 8% to 14% more energy efficient. Installing an on-demand unit at each hot water faucet gives an energy savings of 27% to 50%. The spring season usually brings an increase in buying and selling to the real estate market, and housing experts are mostly optimistic that this spring will be even better than recent years. Some signs are already there: Housing inventories are declining, housing affordability is at record highs, mortgage rates are at all-time lows, and the job market is improving. Existing-home sales have been edging up in recent months, and for-sale housing inventories were at nearly 2.4 million units in December, reaching its lowest point since 2005, according to National Association of REALTORS® data. NAR’s Chief Economist Lawrence Yun says home prices are beginning to stabilize in many markets. Also, NAR’s Housing Affordability Index is at its highest level since the 1970s, which indicates that for the average family housing is very affordable. The National Association of Home Builders is also predicting an improvement this spring among the new-home sector. NAHB is predicting that home sales will increase 18 percent this year, that’s after facing their lowest on record in 2011. However, threats to a housing recovery still loom this spring. Strict mortgage lending is keeping some buyers on the sidelines, and foreclosures continue to put downward pressure on overall home prices in many markets. "The signals are a little hard to extrapolate, but ultimately by the end of this year we should see the housing market on more solid footing," says Celia Chen, senior housing economist with Moody’s Analytics. "So an improvement but off of very, very weak activity." Yes its that time of the year when families start dreaming of a NEW HOME for the New Year!. Our office phones have already started ringing for listing appointments. We are here to serve all of our clients real estate needs. Everyone needs to have a warm safe place to rest their heads and hearts. Call us today to get a JUMP on the spring market!! Don't wait to long, you want to be in the best position to sell your home and that means putting your home on the market for sale first! To learn more about todays market conditions Call Us @ 586-685-2387 to make your appointment today!